Originally from South Korea, Henna Kim currently resides in Canada. She received a bachelor of fine arts degree from Korea University and a master’s in religious education from Knox College, a federated college of the University of Toronto. She has also studied fine arts at several other universities, including OCAD University in Toronto. 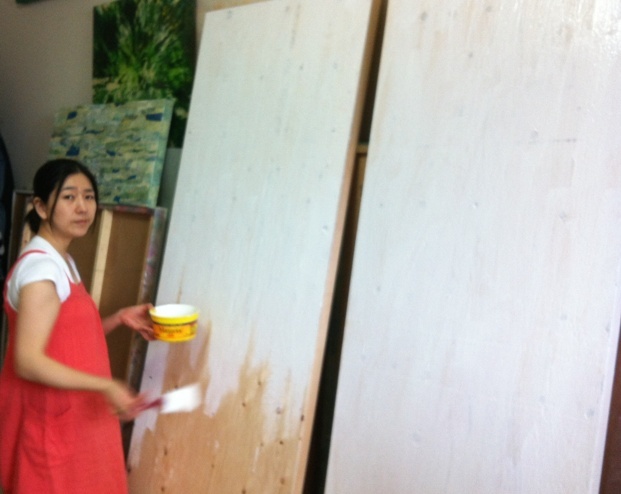 She actively exhibits her artworks throughout Korea, Canada and the United States. Kim’s main inspiration as an artist comes from spiritual experiences; she is continually exploring ways to represent her inner spirituality using visual forms. She hopes her artwork offers therapeutic pleasure and spiritual comfort for viewers. My images are an invitation to a visual fiesta, a call to venture into one’s own soul. Through painting, my intention is to capture the incorporeal aspects of human existence, things like emotion, intuition, memory and thought, and how they manifest in our daily lives. To express invisible realities through color, shape and physical materials is to bring the numinous into focus, to provoke an inner spirituality. As an immigrant artist from Korea to Canada, I struggled to overcome the differences in culture and language. These hurdles spurred me to investigate the connection between the East and the West. I found that spirituality connects the two, narrowing the gap between vocabularies. Divine experiences and beliefs are the main inspiration that leads me to explore the spiritual side of art. My creations are an inevitable visualization of my lifelong spiritual journey. The art-making process is for me such an overwhelming and mysterious experience. Painting my impressions of spiritual and emotional moments brings me into a deeper self-awareness, heightens my inner senses. When looking deep inside myself, I feel the spiritual resonance that is breathing and pulsing throughout like a silent vibration in a huge vacuum. My whole body becomes a free soul that floats like a feather. While painting, I take spiritual voyages by tracing this endless vibratory movement. At that exact moment, my spiritual senses become so alive, so vivid, that I can ultimately encounter the way, the truth and the life. It sometimes feels as if I’m walking through a secret garden in a dewy morning or lying on the surface of a serene sea under a warm sun. I tried to express these feelings through a series of works called I Come to the Garden Alone (2009). Every year I choose new themes and meditate to produce art pieces. This process challenges me artistically and spiritually. In the work Laugh until I Cry (2011), for example, I tried to evoke the wondrous beauty of flowers unfolding into full bloom. The repeated images are meant to express the spiritual resonance: each section of the painting is a sampling of the microcosm and macrocosm, representing the whole body of the object as well as the atomic field of the object. Other works of mine, such as those in the series Studies in Heavenly Things (2010), have a rich palette of somber colors, meant to capture a sense of the sublime in nature. All my art pieces grab a meditative color field that is full of calm and tranquility. More recently I have been experimenting with mixed media on traditional Korean paper and with the encaustic method of painting. Because creating a flow and depth of spiritual vibration is the key to my artwork, I created in my Pilgrim series (2013) collages with Korean paper by applying transparent resin and various waxes onto waves of colours, producing a layered, textured effect. Through this series I have tried to express that our life on earth is a spiritual journey, that we all live in the pilgrim’s progress. The various mosaic colors represent our uniqueness as individuals, and the wrinkled shapes represent our vulnerabilities and limitations. Pilgrim’s Progress in particular shows forth stunning beauty when it is backlit by sunshine coming through the window. I believe our lives are the same: when the light of truth shines through us, we sparkle in harmony with one another as mosaic pieces in the Creator’s masterwork. I hope that viewers of my work will undergo the same experience of spiritual sensation that I encounter as I paint. 1. Snow Flower. Encaustic, 15″ x 19″ x 1.5″ each. 2. Yet I Sing a New Song 2, 3, 4. 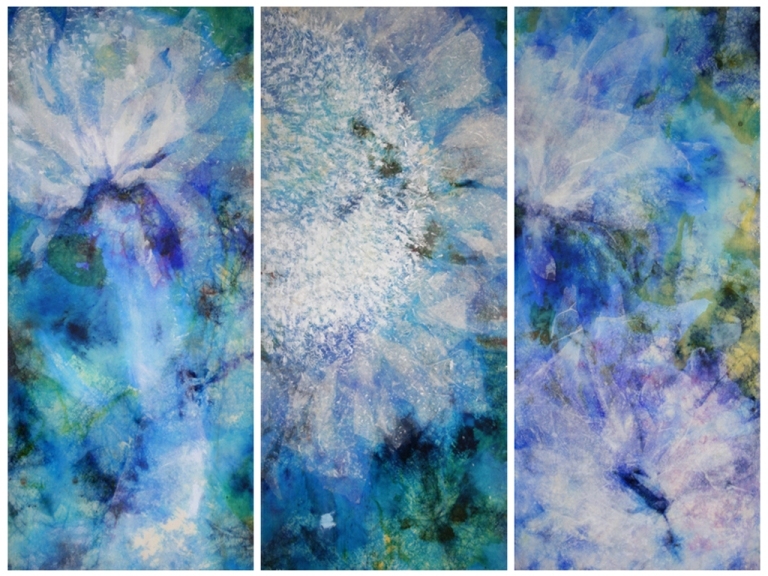 Mixed media on Korean paper, 36″ x 16″ x 1.5″ each. 3. Come and See. 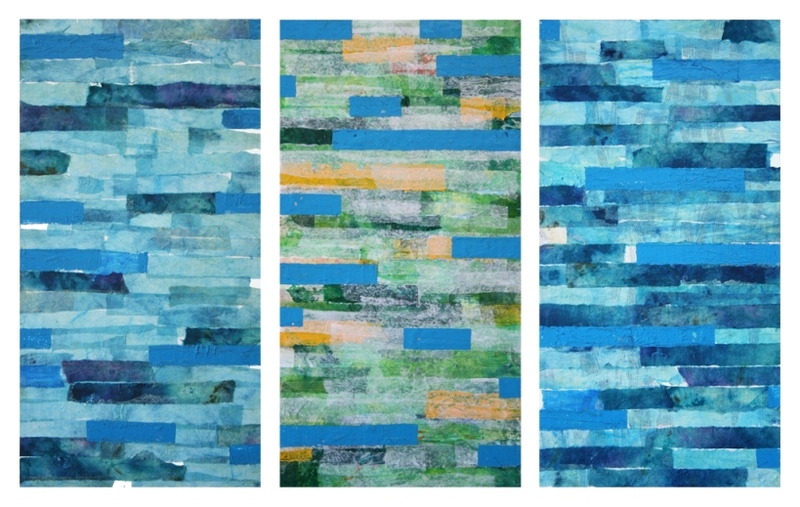 Mixed media on Korean paper, 32″ x 16″ x 1.5″ each. 4. My Lover Is Mine and I Am His. Encaustic, 28″ x 28″ x 1.5″ each. 5. Your Name in the Sky. Mixed media on Korean Paper, 24” x 24” x 1.5” each.